A Warwick company, which is modernising the property industry, is expanding as it takes on more people and relocates to a larger office to cope with demand. Nimbus Property has employed seven new members of staff and moved to a larger office within the University of Warwick Science Park’s Warwick Innovation Centre as it continues to attract business from a number of high-profile firms. The company, which was launched 18 months ago, holds the largest private database of property information for England and Wales, containing 32 million addresses and 27 million registered titles. Its land search technology grants instant access to information including all of a development’s key details in an easy to use map accessed through an online portal. As a Land Registry and Ordnance Survey partner, Nimbus Property allows clients including retailers, property developers and care home developers to analyse data and assess sites using the most accurate data. Nimbus is a spin-out company of an existing business based at the Science Park which benefitted from the centre’s Ignite programme that assists with mentoring support and starter offices. As the company was growing, Nimbus turned to support from Warwick Science Park’s Business Ready programme around sales processes and strategic planning. This enabled them to prepare for further growth and resulted in taking on a business development manager, sales director, software developer, marketing manager, sponsoring PHDs and two digital marketing apprentices. The firm is also looking to recruit more staff in the future. Dirk Schafer, Project Manager of Warwick Science Park said: “Our incubation programme was ideal for Nimbus as it separated their two very different business activities. This gave them a really good starting point to help them exploit their Big Data technology. Simon Davis, of Nimbus Property, said: “Our first 18 months have been extremely successful and we have built up a client-base which includes some very high-profile organisations. “Nimbus Property was created by property professionals for property professionals and we have received some very positive feedback. “We have gone from two to a nine-person team and are still growing as we look to take on more staff in the coming months. The company is now looking to continue to grow its client base as it aims to become the go-to platform for property professionals. 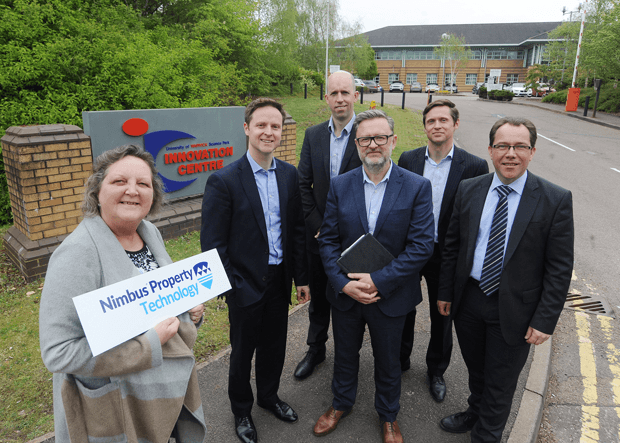 Karen Aston, centre manager at the Warwick Innovation Centre, said: “Nimbus Property has gone from strength to strength and has seen an incredible amount of growth in its first 18 months.